I felt like painting today, but not something intricate. I had recently seen some painting on rocks and thought, like the gift tags, that might provide just a fun afternoon off. We have a lot of colorful river rock left over from building the house that are a nice variegated pink or a dark blue-green, so it didn’t take long to find an attractive substrate. I had some acrylic craft paint left over from a lamp painting project I finished years ago so I used those. The palette was limited but it seemed to go well. The major problem was my brushes. They were on the old side and I didn’t have as much control as I wanted. I’ll have to buy new ones before I do it again. Gloss sealer brought out the stones’ colors, just as if they were wet. The sheen made it a little bit difficult to photograph but here they are. They are only about 1″ x 2 1/2″ but they were fun and fast to make. They can be used as paperweights or just a little decoration. I think I like the one on the left the best. 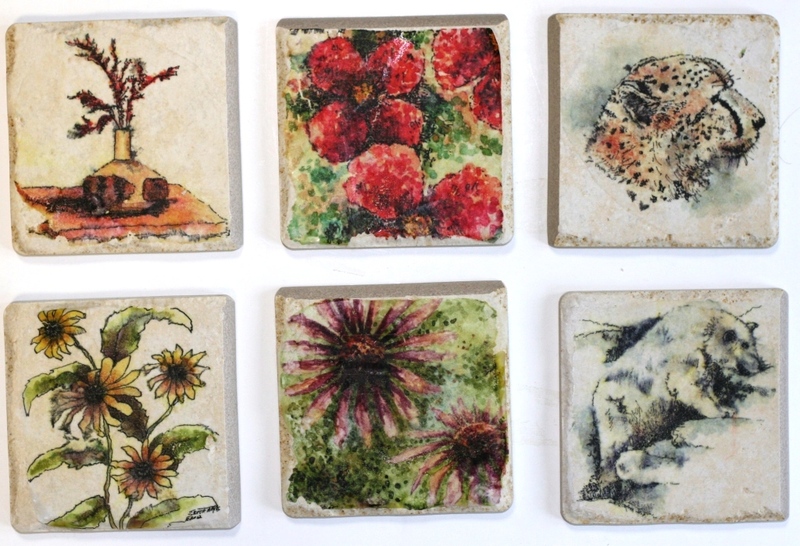 I made up the rest of the tile coasters last week – and I still think I need help. Although I believe that one of the problems I had was that the transfers were a bit too large, I am still having a bit of trouble with the adhesion. The two animals and the vase and daisies look the best but the edges of the other two are still loose. Maybe when I pour on the sealer they will improve, but so far I am not happy enough with the process to sell them. Over the next few days I am going to try and put that on so we can try them out. I also spent a few afternoons making more tags for the Indianapolis store. Some may be suitable for the cards, but I will probably wait to make them until I sell some in my etsy store. I’ll wait to see what I need. So you can see, it has been a week of a lot of little projects. I managed to make it over to the other craft store this week and, as I had hoped, it did have the green and yellow printing ink I wanted. Unfortunately, after that, things didn’t go as smoothly as I would have liked. The day after the longer trip to the other store I set up to use the new inks. I wanted to use a streaky blend of the two to create a textured effect. But when I went to squeeze out the yellow, it dribbled out a thin liquid along with the pasty ink. Not good. I was unable to work out a smooth consistency with it. I thought adding the green ink would help but it didn’t really. By the time I got it to the consistency I needed, the colors were blended far more than I wanted. I also had too much ink. I made a reasonable print, but it didn’t have the striated effect that I was going for. You can see the center is a little bit lighter green than the edges, but I was going for a more dramatic variation. I was glad to see that the little nicks I put into the ears came through. I also think I will take more off of the sky area to differentiate it from the grassy ground. I returned to the store and exchanged my tube for the only other one they had. I did check this one first to make sure as best I could that it was okay. I haven’t tried it out yet, but plan to this week. So, after giving serious thought to the comments from Leslie and Cindy, I decided to make some blank cards using the smaller tags I showed last post. Since they were too small to be placed on the 5×7 cards I already had, I bought a package of minimum postal size envelopes and cards as well as some archival glue dots and put them together. I must say I am pleased with the results. I think they look quite nice centered on the cards and still can be framed if so desired before or after mailing. And no hole punches either. I decided to mail one to myself before I listed them, just to make sure they can be handled by the postal system without damage. The watercolor stock paper is on the thick side and I don’t want it to crease in the machinery. I’m pretty sure it will be okay but I want to test it just to make sure. I’m hoping it arrives back home today. If all goes well, I’ll make up the rest of the package and list them online. I sat down for a while this week and inked up the blanks I made. I started with the smaller gift tags because for some reason they are less intimidating. I had the impulse to put an iris on one of the skinny ones and I rather liked the way it turned out, so I did several more as well as a few of the more standard abstract flowers. 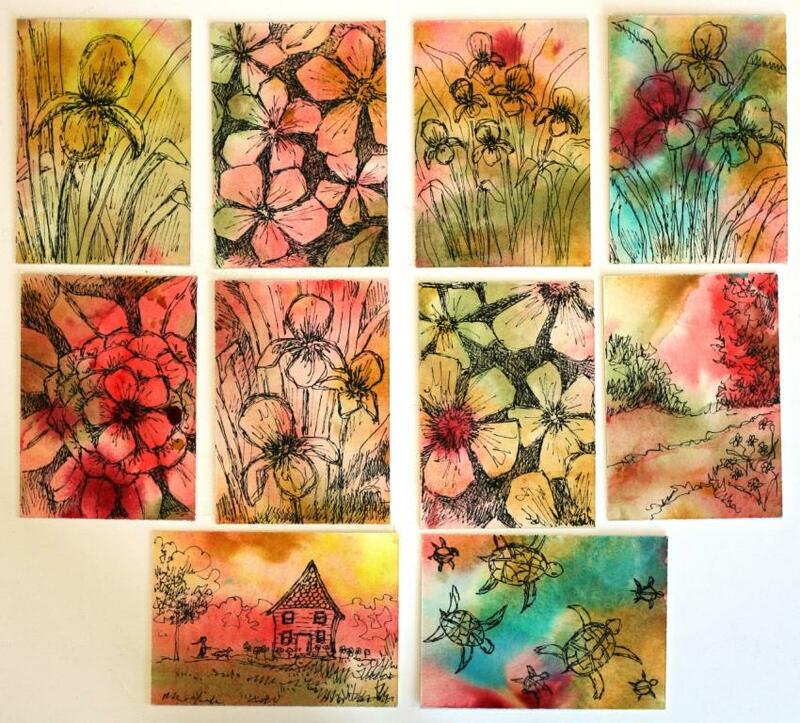 When I started on the larger aceos, I made a few with bunches of irises too. One with a more horizontal flow of paint reminded me of my little painting of the dog walker so I quickly sketched that one out. It might be fun for a house warming gift. I am going to make a few more with an architectural theme. Just thinking about it, it might be productive if I consider different event uses for them and let that help dictate what I draw. Maybe birthday gifts, shower gifts, I don’t know. I do think I will list some of the iris ones. I am most pleased with them. I thought the ones with blue on them might work as a water theme and drew the turtles on that one. I think am least pleased with it. 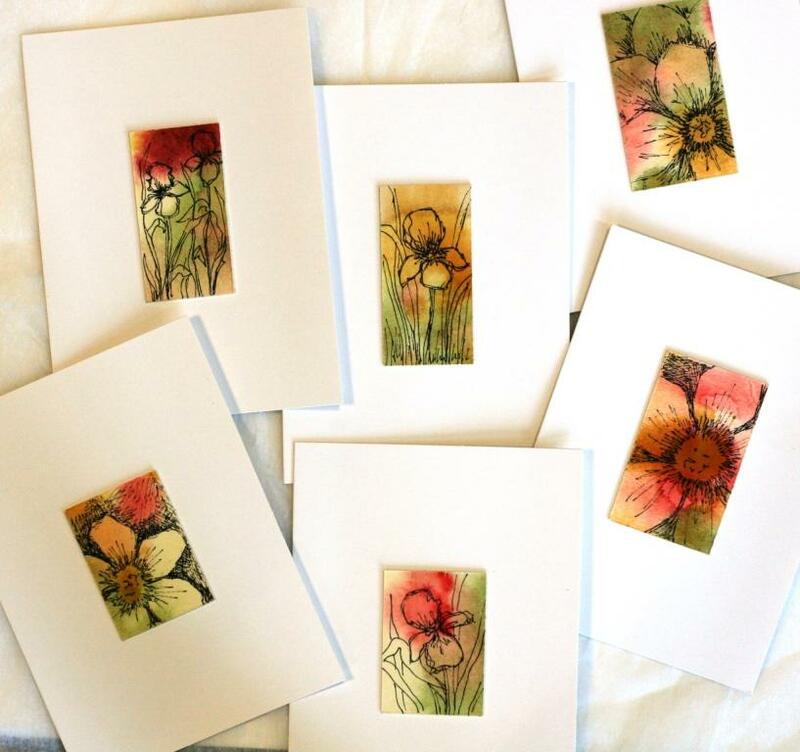 I have 10 aceos left so I will probably do a few more. I went to the craft store to buy some different colored printing ink but all they had was the red. No yellow or green, so I didn’t ink up the latest linocut. I really wanted to blend those two because it is a plant print. The store hasn’t had a lot of colors lately and not been restocking so I might have to try the other craft store. It is farther away so I go to it less. 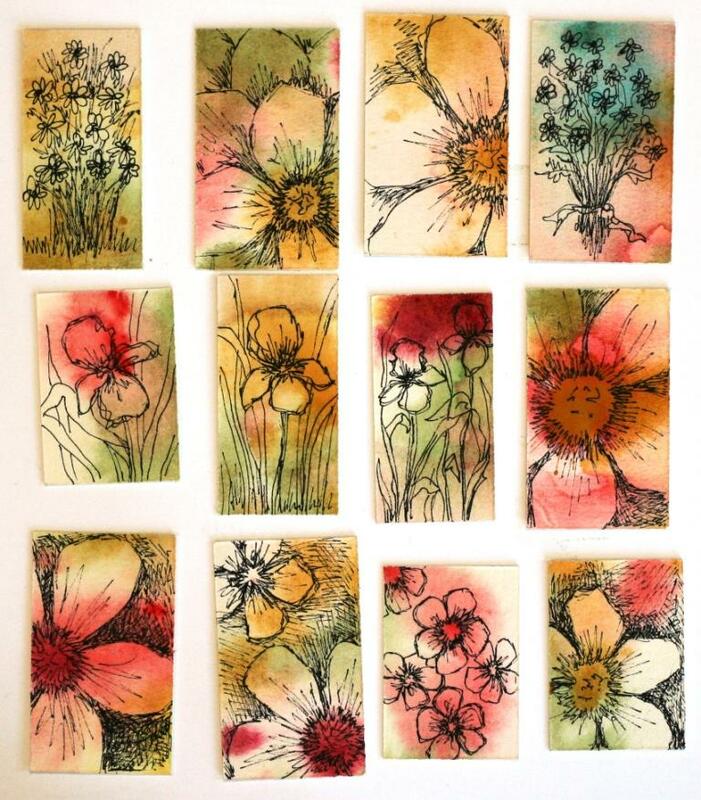 I decided to make up more aceos and little gift tags this week. Since I left most of the ones I did’t have listed in my etsy shop at Lilly’s Soap Kitchen, I wanted to have some on hand for resupply. It takes me three days to make up the blanks. First day I have to stretch the paper. It is a pretty heavy duty half sheet and I am sure it would warp too much if I just laid on the watercolor wash without the stretching step. The next day, when it has dried, I rewet it, totally re-saturating it with water so I can get a nice flow of color. 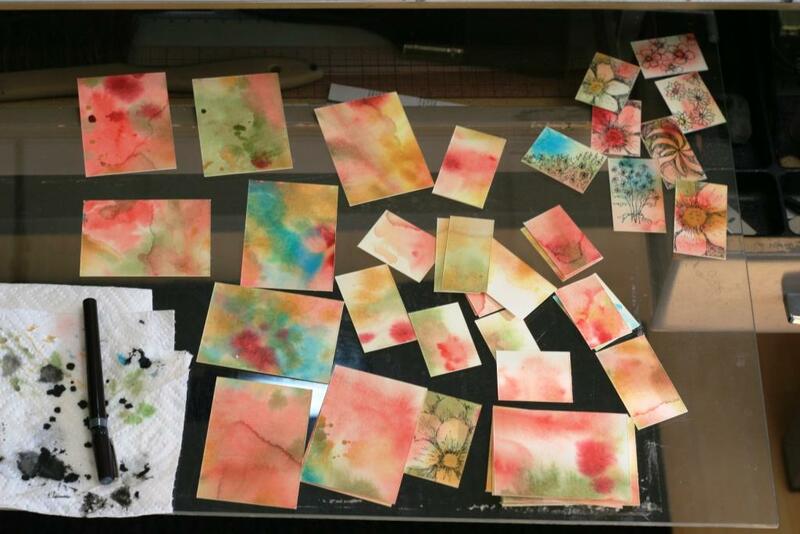 I lay on the watercolors in a abstract pattern that seems appealing to my eye and when the paper has started to dry a bit, I flick on droplets. It is hard for me to tell how it will finally look at this point. I want a wide variation in depth and type of color, but not so much it muddies or is too dark to ink on. Again, I wait overnight for it to dry and lay flat. Then I remove it from the stretcher board and decide how to cut it up. It takes a while because I try to map out some pleasing combinations before the cuts are made. Also, the size doesn’t work out evenly for the aceo size, so I have some leeway on where to cut it. In fact, I get the little gift tags from the cutaways. I lay a bunch of the blanks out on a sheet of plexiglass that I wedge into the drawer of my drafting table. I work on them for a couple of hours at a time getting into a rhythm of inking but not a lot of thinking. I don’t know why, but many of them remind me of flowers so that is what I do. 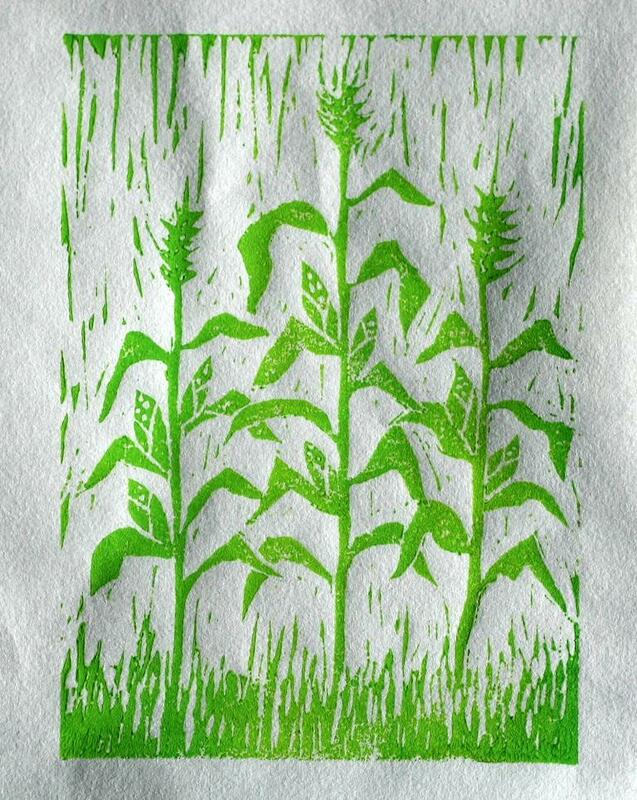 I also made up another linocut. More about that one later. 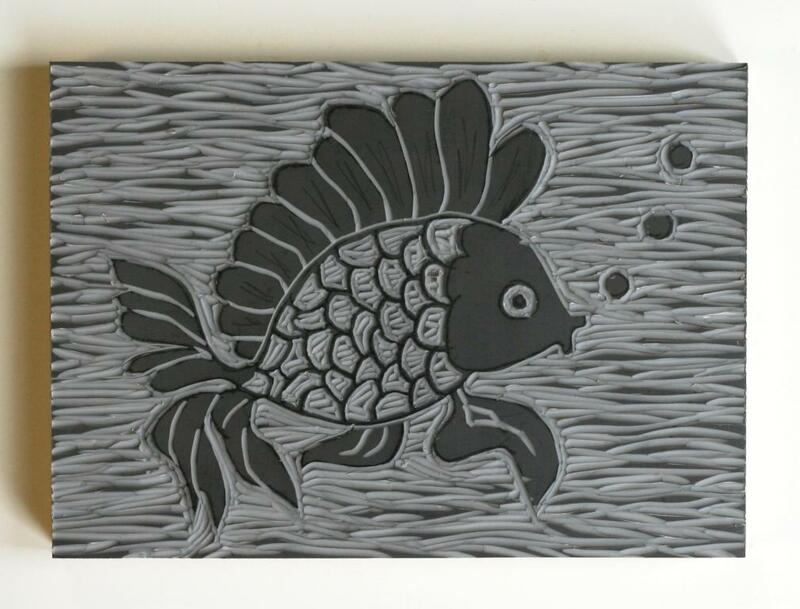 I finished up the fish linocut on Thursday and I think he turned out pretty well. I decided not to cut into the upper fin because I didn’t want it to get lost in the background. I like the flow in his tail and lower fins but I didn’t want the upper fin to compete so I just left it. After pulling the print, I still think so. The positive/negative space seems good to me. When I considered what color to paint him, it just seemed obvious to make him a fancy goldfish. I used my yellow ocher to do it because I thought it would provide a rich contrast to the black. What do you think of doing one with the golden body and aqua water? The idea of just the water colored doesn’t appeal to me. Just thinkin’. And I’m pretty excited because this week I have put a few things into a new brick and mortar shop in Indianapolis. She has a lovely selection of handcrafted items, art, and soaps. Check out Lilly’s Soap Kitchen on Virginia Avenue if you are in the area. And of course these are listed in my etsy shop. The linocuts were talking to me midst the tile debacle and I did a few quick sketches of animals for kid’s room art. I settled on a fish cut, a rooster, and a rabbit. 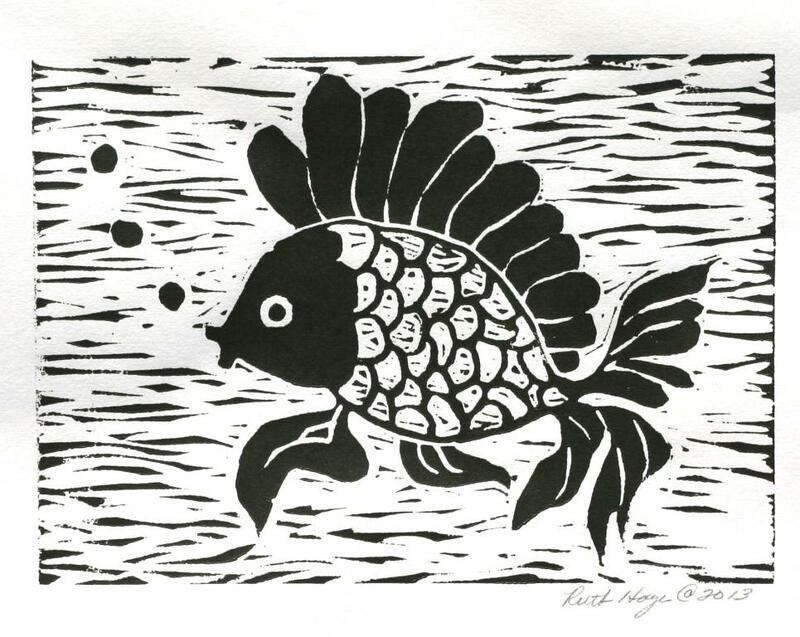 Here is the first one – a stylized fish. I am still debating if I should cut out the head portion. I wouldn’t do scales on it, just a solid cut. I have sketched in a few lines on the upper fin, but I am inclined to leave the rest of the fins as they are. 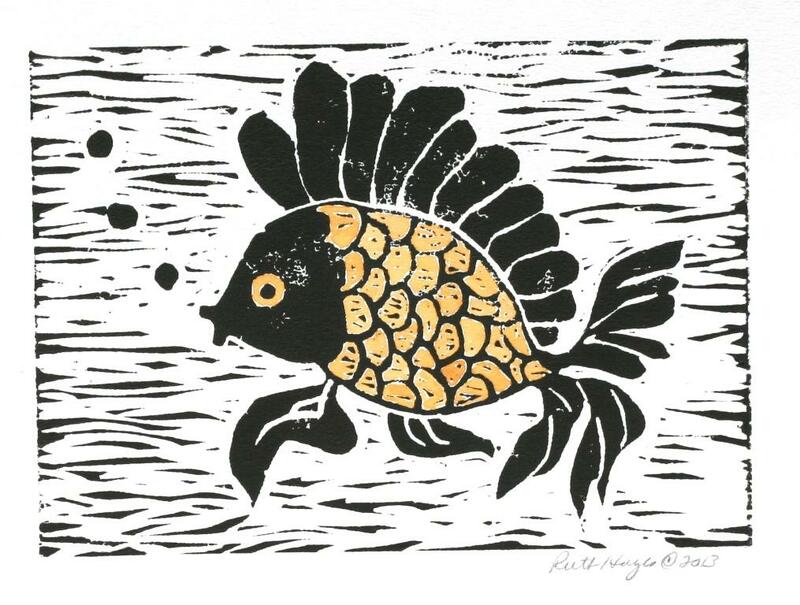 For the colored print I would use a dark yellow on the body and make him a fancy goldfish. The three framed together would make a good tryptic artpiece. As an update on my tile tribulations, I found a library book that gave me a few helpful hints and as soon as I can print up a few more transfer sheets, I will try again. Evidently, I have been ironing them too long and that contributes to the smearing.